5,337 U.S. Airstrikes against Syria: When Is “Direct Military Intervention” Not Direct Military Intervention? That’s a peculiar thing to say, given that the Times regularly covers the United States’ ongoing direct military intervention in Syria. Since 2014, according to official Pentagon figures, the US has carried out 5,337 airstrikes in Syria. According to the monitoring group Airwars, these airstrikes (along with a few hundred strikes by US allies) havelikely killed between 818 and 1,229 Syrian civilians. 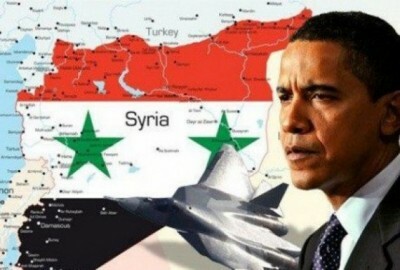 Nor is direct US military intervention in Syria limited to aerial attacks. 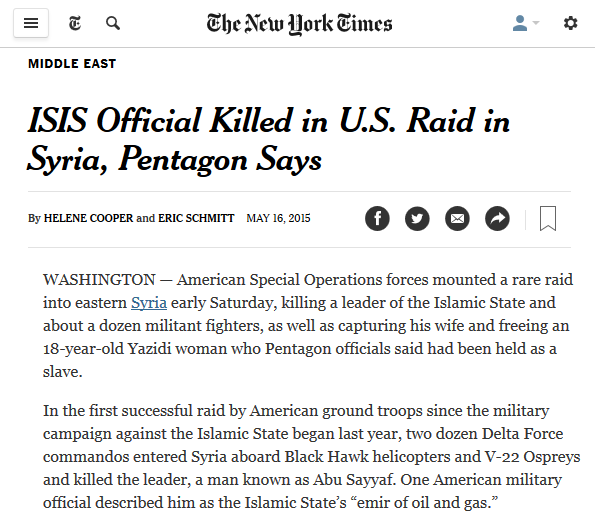 In May 2015, the New York Times (5/16/15) reported on a combat raid by US Delta Force commandos in eastern Syria. Later that year, the Times (10/30/15) observed that President Barack Obama had announced he was sending (in the paper’s words) “several dozen” special forces troops on an “open-ended mission” inside Syria. The Times, for its part, is engaging in some kind of linguistic contortion of its own to make none of this qualify as “direct military intervention in Syria.” Presumably it has something to do with the airstrikes and special forces not being aimed at the Syrian government of Bashar Assad, but at the Islamic State in Iraq and Syria, or ISIS—a rival to Assad’s power in Syria that the US is semi-officially at war with, even as Washington providesarms and training to other armed groups trying to overthrow Assad. Jim Naureckas is the editor of FAIR.org. You can follow him on Twitter at@JNaureckas.